I can only compare it to the same guy just a few weeks ago when he gave a speech about how heinous and evil Islamic State is after they had just beheaded an American on video for all to see. And then went golfing 8 minutes later and was seen yukking it up on the golf course. It is widely agreed that it was those beheadings that ultimately forced Obama’s hand to stop ignoring the Middle East he had allowed to become a fiasco by doing NOTHING – and by making one false assurance after another that he had terrorists on the run – that forced America back into the war Obama took so much damn credit for getting us out of. If you’re going to order men to war, you treacherous coward, the LEAST you can do is value your military more than your damn latte and pretend to show them the dignity and respect they deserve. Update 9/25: As usual, the psychotic left that so rabidly despises George Bush is pointing to none other than George Bush to justify the behavior of their messiah Obama. I mean, dude, if you think Hitler is a bad guy, DON’T POINT TO HITLER TO JUSTIFY THE BEHAVIOR OF YOUR HERO, OKAY? I could jump on the horns of the dilemma and say that they both ought to be impeached, but it turns out that there are a few things that make these two salute situations very different. The first is that Obama is carrying a latte cup while Bush is carrying his dog who is essentially a family member. Which would you say is easier to toss into the trash on your way out of the plane? NBC in its propaganda effort to protect their messiah Obama cited a picture of George Bush trying to salute with Barney in his arms says Bush. They say that Bush should have put Barney on a leash. Well, have you ever tried to walk a short-legged dog off the steps of an airplane ramp? Unlike the coffee cup that could have and should have been trashed, SOMEBODY had to carry Barney off that plane. 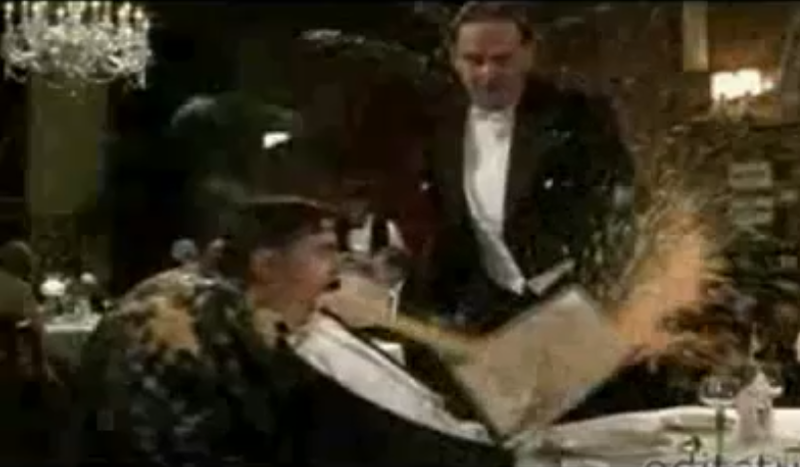 And Bush did it himself rather than insult a Secret Service agent and have him carry the dog. The second thing is that – despite the fact that Bush was carrying the larger and more awkward bundle of Barney versus Obama who only had a damn coffee cup in his hand, Bush STILL managed to salute with an empty right hand as the photo shows. Which is to say that Bush came CONSIDERABLY closer to rendering a proper salute than Obama even though Bush had a much more substantial burden to carry than Obama had with his stupid coffee cup. But it’s the third thing that makes the cake: when was the Bush photo taken? It was taken on June 26, 2001. Which is to say it was taken only five months into the Bush presidency and it was taken four months before America was attacked and President Bush found himself a president at WAR. What was awkward, if not cute, prior to 9/11/2001 when America was attacked and Bush ordered the men who saluted him into war is rightly a national disgrace now. This is similar to another of Obama’s grievous displays of his contempt for America. George Bush loved playing golf. But when the left attacked him for golfing while he was sending our sons and daughters into war, what did Bush do? He had the character to stop golfing and never played another round during his presidency. He sacrificed something he genuinely loved for the good of his nation. Let’s look at that comparison, too. Obama – as I already pointed out above – was on the golf course smiling and laughing only EIGHT MINUTES after describing the horror of beheaded journalist James Foley. 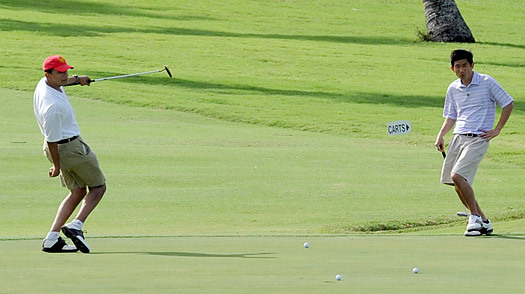 He was back on the course AGAIN within less than a day in spite of the deserved criticism for the round he had just played. Then he later blamed the media for his “bad optics” as a man who pathologically refuses to accept responsibility for ANYTHING. Obama is a man completely devoid of decency or integrity. Since becoming president, in spite of the fact that he has been a president at war just like Bush was, Obama has played nearly 200 rounds of golf. Compare that to professional golfer Tiger Woods, who has played 269 rounds of golf during the same period. Obama’s behavior is not only a sick joke; it’s a national disgrace of a president who WILL NOT DO HIS JOB AND DO WHAT IS RIGHT FOR THE COUNTRY. Obama had just ordered America back into war. I mean, he had JUST ordered America back into war when he delivered this shame of a salute. 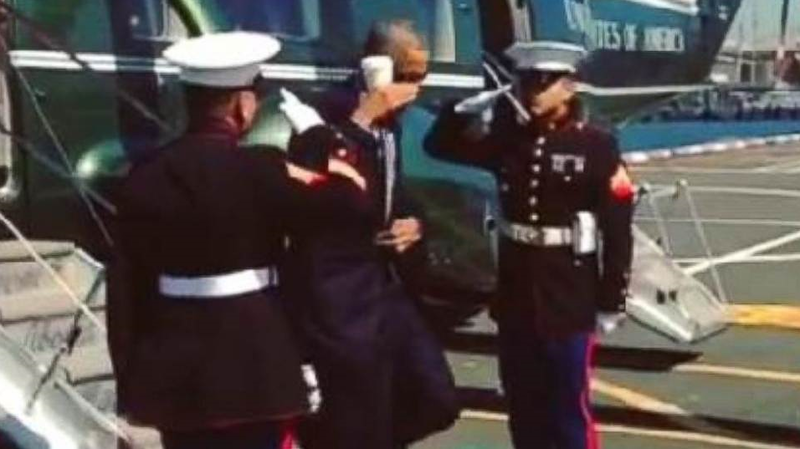 You tell me that the left wing media wouldn’t have gone bat-poop ballistic if Bush had given that disgrace of a salute with that damn coffee cup in his saluting hand if Bush had done that the day our military was fighting in Afghanistan after 9/11. Could some propaganda hack show a picture of Bush golfing and then claim that Obama wasn’t doing anything Bush hadn’t done? Yeah. Their are plenty of “journalists” dishonest enough to do that. Would those Goebbels hacks point out the differences that make Bush so much better than Obama it’s not even silly? Absolutely not.